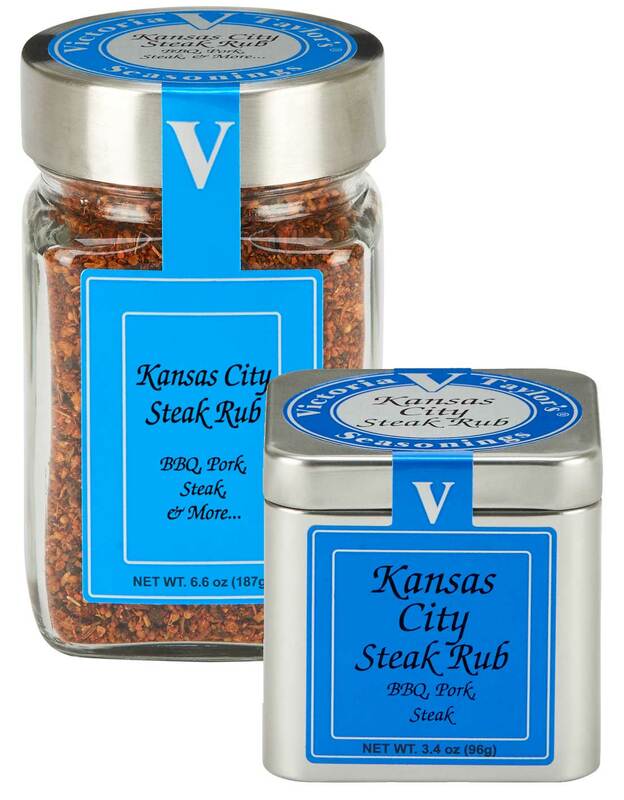 Our Kansas City Steak Rub is Victoria's take on this classic steakhouse seasoning blend. Victoria's Kansas City Steak Rub combines large pieces of black peppercorns with brown sugar, paprika, garlic, mustard seeds and herbs to create the perfect rub for flavoring steaks and barbecue pork. The black pepper and paprika provide some blackening and the brown sugar caramelizes during cooking to create a slight glaze on the meat. Try Victoria's Kansas City Grilled Steak or Kansas City Barbecue Pork Ribs at your next family cook-out. Mixed spices and herbs (black pepper, chili powder, celery seed, mustard, paprika, thyme), sugar and dry molasses, sea salt, garlic. Contains: Wheat, soy. No MSG, and free of any peanut products. Contains Wheat, Soy.